There's no one-size-fits all approach to adopting and executing social media, but there are several key factors that significantly improve results! 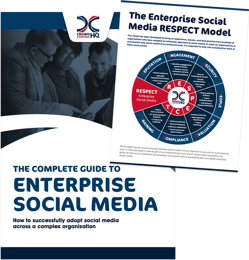 Drawing on a decade of experience working with many of the UK's best-known organisations, we have combined our learning and best practices to developed The Complete Guide to Enterprise Social Media. Download this free guide to discover everything you need to know about successfully managing social media within a large enterprise organisation, from social media marketing, social customer service, to social media risks. The RESPECT Model featured inside the guide walks you through the often-overlooked areas that can help take your social media to the next level. Whether you are only just beginning to take social media seriously, or if you are already seeing results, it is essential that social media is fully embedded into the DNA of your organisation.